Posts related to Samurai Fighting Fish – including my own. This morning I was pleasantly surprised by a large grouping of bubbles floating on the side of my Betta’s tank. If this was any other kind of fish, I’d have been worried but the sight of it filled me with glee. My Betta Lan blew his first bubble nest in my tank. 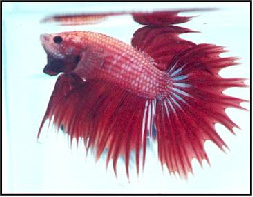 When Betta’s spawn, the males build a bubble nest in which the female betta will lay her eggs. After spawning, the male remains to tend the nest – making sure that the eggs stay in the bubbles and taking care of the small fry once they are hatched (though, you should remove the male soon after as he might decide to eat them…). Generally, they only do this when they are happy – mainly after water changes and apparently (as I read on a website) when the weather’s about to change. Here’s a quick video of how they do it which I scrounged off of youtube. You don’t have to watch the whole reel, but it’s the one that shows how they blow it the best. I’m excited about this because quite frankly, it means that my betta’s happy and that I must be doing something right. It’s been two weeks since I’ve purchased my Samurai Fighting Fish (Betta) and I have to say, this is the most fun that I’ve had with less than 5 gallons of water. I feed him peas once a week, (chopped up bits) and feed him mosquito larvae two to three times in the week. I clean his tank once a week and perform regular water changes. All in all, I have to say that I’ve spend more time on him than I’ve ever spend on any of my other fish. I can’t help myself, he just sort of demands it. If anybody wonders whether or not they should invest in one, I would HIGHLY recommend it. My betta has really enriched my life. I’m enamored with my new Betta Fish. I have so many other things that I can tell you about including a wonderful night at a safari lodge where my Other Half and I spend the night over the weekend and instead, I find myself happily narrating in my mind the first delightful problems I’ve had with my new roommate. Any new relationship has its ups and downs. You have to establish what both parties like, and then find middle ground. The first thing I’ve noticed about my Betta is that there is no middle ground with him. It’s his way or the highway. And, as a gold fish owner, I’m almost unsure of how to deal with it. I like to think that I’m a pretty good fish keeper. Most of my fish live for 4 years or more (and then, they only die when I leave them in the care of others). When I didn’t have a lot of space, I used to keep them in bowls (normally large 10litre glass cookie jars or flower pots) but recently acquired a fairly large rectangular aquarium. Now, I keep my Betta in the one bowl, perched on my printer by my computer because that’s where I spend most of my time in my room. I went through the usual routine of introducing my Betta to his new habitat the moment I got home and made sure that he had enough cover to hide in the bowl. I hadn’t bothered to buy Betta fish food because I had some tropical fish food left over from an accidental purchase and thought that I’d be fine with that (my gold fish love it, why won’t the real tropical fish?!). Lan Harrison does not like flake food. I watched a bit disheartened the first night as he swam around the bowl, tasting every individual flake that was drifting around on the surface and spit it out. Luckily, I had some freeze dried white shrimp that I sometimes feed to my gold fish as a treat so I broke that up and gave it to him so he didn’t sleep hungry. He ate it reluctantly and quite suddenly I knew that I had a problem. 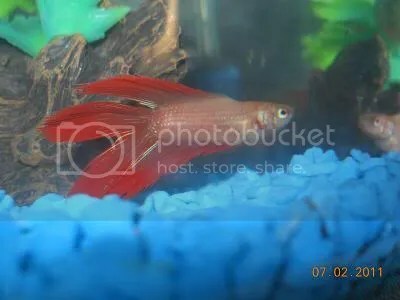 I went online, googled Betta feeding and realized that most Bettas would rather starve than eat flaked food. I wish the store attendant had told me that. So, despite having an absolutely CRAZY busy day yesterday, I wrung time out of my schedule and stormed into a petshop to get some proper Betta food. But, I knew as I drove home to feed it, that there was a big chance that he might not even like that. Because, that’s what Bettas do. They are very picky eaters. He puffs himself up whenever I put my finger near the bowl, puffs himself up and has a tiff with the plants in his bowl and puffs himself up when I use my custom made gravel hoover to take out the waste (and replace some water). He actually went as far as biting the tiny pipe that I use! I couldn’t believe it. I’ve been browsing around the net and one thing’s become very apparent. The moment you have a Betta, you’re hooked for life.